We&apos;re still a few months before the 2014 FIFA World Cup begins (June 12 for all of you non-footy fans), and over the last few days we&apos;ve been hit with a number of World Cup-affiliated bits that have ties to this thing of ours (you know, dance music). The first was this Fatboy Slim Presents Bem Brasil compilation that Fatboy Slim is sorting out for Astralwerks, which is due out on June 3. This actually combines two of Fatboy Slim&apos;s loves: football (if you recall, during the 2002 World Cup, Fatboy Slim played shows in the cities in Japan and South Korea that hosted Cup games, so the traveling English fans could have somewhere to party), and Brazil, the place where Fatboy is actually the most famous (yes that includes the UK). This cut is being called the "unofficial" 2014 World Cup anthem, mainly because Avicii has produced the official anthem. While no clip of "Dar um Jeito (We Will Find A Way)" has been posted online as of yet, word is that Avicii joined Carlos Santana, Wyclef, and others in producing this track, which will serve as the closing anthem. 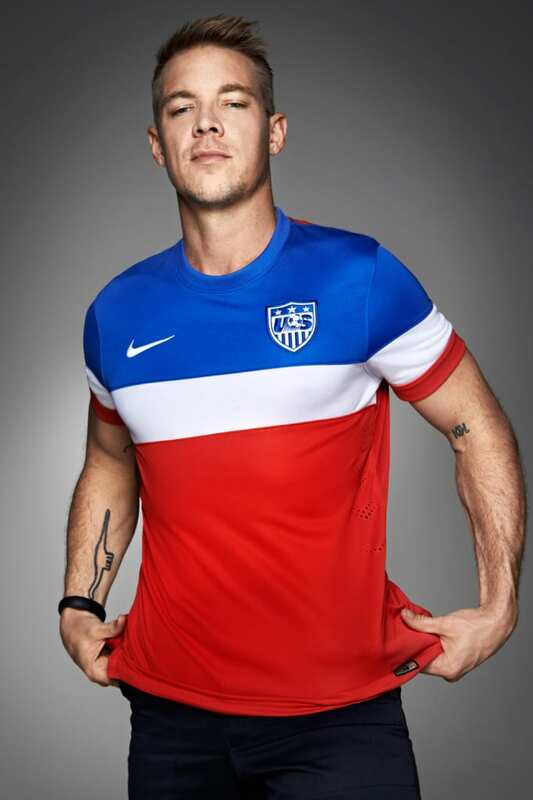 Even crazier is that Nike Soccer recently showcased the "Team Away" jerseys that they made for the U.S. Men’s National Soccer Team, and got a number of people to showcase the uniform, including Diplo, who you can see up above. These are just a few more ways that you can see how the EDM scene is slowly getting more integrated into popular culture.